Of course you don't have a problem that requires the use of Tucks brand hemorrhoidal pads . But let's just say that your sister's best friend might. In fact, it burns her up to use her beauty budget for something so...indiscreet. She would much rather spend $7 on lipstick! Sniff the contents. Hmmm, doesn't this smell just like Tucks to you? Fold a piece of tissue, paper towel, or soft cotton into the right size square. Saturate the piece with witch hazel. Use as you would a Tucks brand pad. 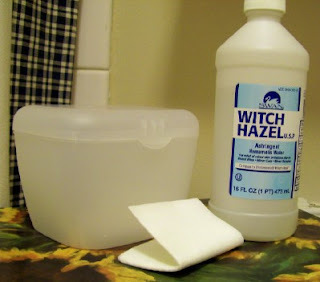 A $1 bottle of witch hazel will give you hundreds of uses with your choice of "pad." You can store precut, presoaked pads in a plastic container. Or do as I do, and wet them as needed. Since even Equate brand pads aren't cheap, this homemade version can save your budget--and your sanity. LOL, thanks for the tip! I'll pass it along to my sister's friend who's due in December. *wink* yeah I have a "friend" who's also due in December, a couple of days after I am. haha! I just wanted to say that even if you don't need these for traditional use, they feel great after having a baby (my last babe was 11lbs, and I had her at home). If you want to take things a step further...you know those little washcloths sold in baby departments? They're super soft - and therefore unchafing - and cutable into smaller squares for use in exactly this fashion. Then, they're washable along with your burp cloths, messy clothes, diapers, or other things that would require a good thorough cleaning (and the witch hazel on the cloth gets washed into the water as a further washing aid, even if it has been near your...uh, sister's friend's bottom). I'm not the only one that does this? Yay! I actually prefer to use a cotton ball. I can get a lot of witchhazel on there and it seems to saturate the sore areas much better without the pain of wiping something across the already painful spot. I may not like having to use them, but I earned em by giving birth two my kids as I think most moms have. Thanks, Hubby likes these for.. his sister's friend. So we try to buy generic but this might work for him. I work as a postpartum nurse. We have our patients use tucks pads for their stitches. I encourage my patients to keep their tucks in the fridge. The cold helps numb and help with some swelling. I have also heard of keeping them in the freezer. Just something else to pass on. Great post! I used witch hazel after I had my babies, and it's also a nice astringent for the face. Tricia is so right, cold witch hazel feels wonderful on swollen stitches. Good for you for helping people out. I wonder if anyone knows the "garlic clove to combat a yeast infection" trick? I am not an MD and don't want to be responsible for anyone having a medical problem, but I heard folklorically that a garlic clove inserted into the affected area banishes yeast infections, and will save you a fortune on Monistat! Meredith, thank you for bringing up such a necessary but little discussed topic. Another healing remedy I can share, after having 3rd degree tear with first baby and 2nd degree with second, is essential oils of patchouli & lavendar. Fill one of those little periwash bottles the hospital gives you with warm water and add one drop each of patchouli & lavendar (just make sure they are real essential oils, not blended with anything else) and shake well before using. I now associate the smell of patchouli with newborn baby instead of hippie incense! those round make up rounds work great for this. On faces, stitches, or poison ivy, I'm not ashamed to admit it. Not sure about the fridge thing though. Can you say la BRR? Thank you for sharing this. I love natural, homemade recipes for health care. My question is well being a first time mom... do you put the witch hazel directly on your napkin ? I guess what I am trying to say is how do you use it ? Yes, just soak the napkin with witch hazel and use it as you would a storebought pad. For personal cleansing, including in the feminine areas where you might have had stitches. And as a temporary compress to relieve swelling or burning. That's where keeping them in the refrigerator makes them extra effective for reducing the swelling. For more explicit directions, please click on the highlighted phrase in the text above "USE AS YOU WOULD A TUCKS BRAND PAD" and you'll be taken to the Tucks website. I worked as a delivery room nurse and we always recommended using witch hazel soaks after delivery. 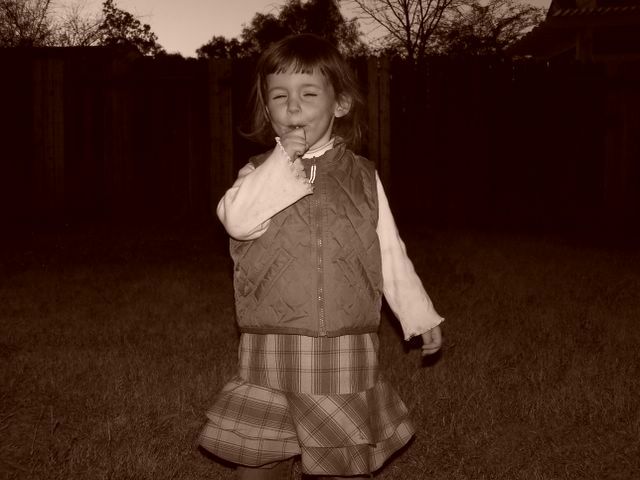 Great post - I'd never heard of Tucks before, and definitely could have used them after my daughter was born. Plus we're due again any day (well, actually due 10 days ago), so this will come in very handy! I agree - this is one of those things that women never talk about!! Thank you sooo much for this. I am a member of a message board that is full of pregnant women and we ALL love to save money and do stuff more natural ways so this will work perfect. I have already shared it with two of the boards.